Silverhawk Self Storage is Open for Business in Murrieta/Temecula! On Friday, April 5th, the San Diego Self Storage family officially welcomed a new member: Silverhawk Self Storage. 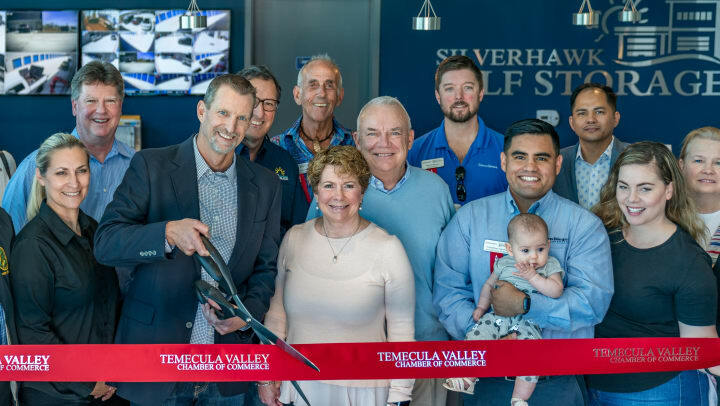 Friends, associates, and ambassadors from the Temecula Valley Chamber of Commerce were on site for the ribbon cutting. Attendees were treated to a behind the scenes tour of the brand new facility. Adjacent to Temecula’s Roripaugh Ranch Community, Silverhawk Self Storage offers affordable, clean, convenient ground floor self-storage units to meet your storage needs, no matter what you are storing. Units are as small as 3’x5’ (15 square feet) and as large as 12’x30’ (360 square feet), with numerous sizes in between. All of the self storage units at Silverhawk Self Storage are ground floor accessible. This means you don’t have to bother with stairs or lifts. You simply put your things on a cart and wheel them to your storage unit. Or better yet, just pull your vehicle right up to your self storage unit door. If you need a truck to move in, we offer a FREE move-in truck with driver. We provide the driver, the truck and the gas. All you have to do is load and unload your things. It's that easy! Additionally, climate-controlled units are available. Our on-site resident manager will be happy to help you find the right unit and review the current move-in specials! This seems like a great opportunity to remind you of our generous referral program. We offer our valued customers a referral fee for every friend of yours who rents a space at any of our 20 San Diego Self Storage locations. For each friend you refer and who rents a unit, we will give them a $50.00 credit toward their next month’s rent, and you in return, will receive a $75.00 credit toward your next month’s rent. Just have your friend fill out a Tell-A-Friend card on site and you will both receive your rental credit! These premium features are coupled with our "1st Year Price Guarantee," which provides you with the peace of mind knowing that your move-in rate will not change for the first year you store with us (our lease is month-to-month). Please join us in congratulating all of our team members who were intricately involved in building and opening this new site. We are honored to be a good neighbor and contributing community member of Murrieta. Thank you for the warm welcomes.